The 34 metre Maibaum is removed from the wagon and positioned ready for lifting into place in Putzbrunn, Germany. 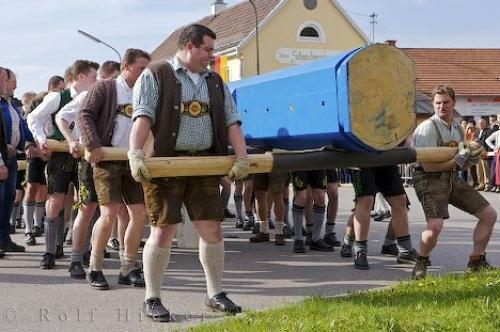 Once the Maibaum is wheeled close to where it will rest for the next year, the men of Putzbrunn, Germany begin the hard work of lifting the tree off wagon to beging proceedings. What you do not see in this picture is a bed of beautiful spring flowers which are about to be trampled and the men inch closer to mark. Photo of the Maibaum being lifted by a team of men in Putzbrunn, Germany, Europe.